Play includes lacrosse for boys, grades 1-8, and Lacrosse for girls, grades K-8. 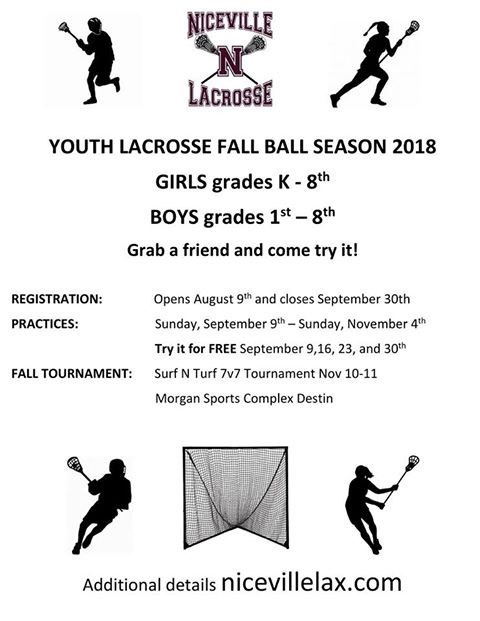 The Niceville Eagles Lacrosse Club is encouraging area youngsters to participate in youth lacrosse. Registration for the fall season is now underway and will continue until Sept. 30. Free clinics for new players are scheduled throughout September. New players are invited to give it a try! Practices begin Sept. 9 for returning players. Lacrosse is a team sport played between two teams using a crosse (long-handled stick) and a lacrosse ball. Players use the head of the lacrosse stick to carry, pass, and catch the ball. Points are scored by shooting the ball into the opponent’s goal. 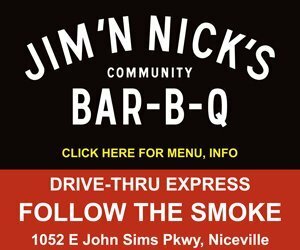 For more information or to register online, visit www.nicevillelax.com/.